If you love to grill and are a meat eater, then this tip will be most helpful when you fire up that grill next time. 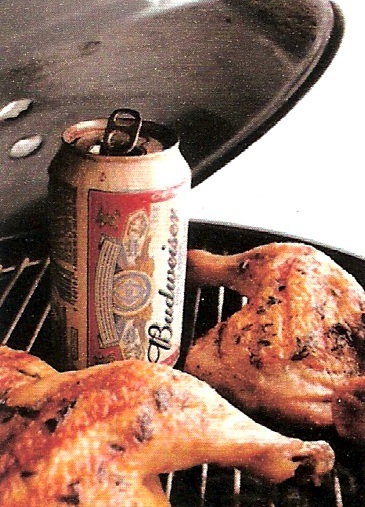 To keep meat moist & add flavor while roasting or grilling with a closed grill, place an open can of beer over the hottest part of the fire. The beer will boil and saturate the air inside the grill with water vapor, beer flavor and the alcohol! My recommendation is to consume close to 1/2 of the can before placing on the grill. A win-win situation! This entry was posted in Tips & Tricks and tagged Grilling, tips. Bookmark the permalink. I agree with your recommendation about drinking 1/2 of the beer! I haven’t tried it w/veggie burgers, but I would assume that it work work the same and give it some additional flavor!